Who needs to IPO anyway? I'm not sure why successful tech companies need to IPO. If its growth capital you want then you're in the wrong sector. The whole beauty of tech companies (with the honourable exception of fab-happy hardware semis vendors) is that you need minimal capital to grow. If it's an exit you want, then Google, Oracle, SAP or any number of private equity shops are quite willing to buy you out for a tidy sum. Maybe there's something in the investment bankers schtick about needing publically traded stock as acquisition currency. But if you believe your stock is undervalued why use it on acquisitions, and if it's overvalued you can probably afford to pay cash anyway. Maybe its just the ego and the public acclaim. That whole ringing-the-Nasdaq bell thing (but if you've succeeded in creating a highly successful tech company... surely you're not that dumb?). Often what's more interesting is the companies which remain private. For example Bloomberg LP, which is probably the biggest cloud company you've never heard of. Forget Apple's we-only-have-25-SKUs crap. 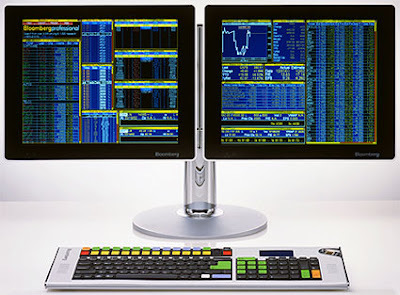 Bloomberg are the ultimate one-product company. For the princely sum of $1600 bucks a month, they will rent you a terminal (a Bloomberg) which gives you market data, analytics, pricing, news and access to their proprietary messaging system Bloomberg Messenger (think of it as Blackberry Messaging for American Psychos). The terminal (or an app which provides equivalent access) actually looks remarkably crappy. You get a text-based interface with neon-on-black text which looks like something out of Wargames. It's actually quite a good spectator sport to watch UX gurus spitting into their double-vanilla-cream-lattes at the very thought of it. Actually once you get your head round it the interface is pretty understandable (I've been using them on-and-off since 1999), although I'd advise you order a stiff double-vanilla-cream-latte before tackling the user manual. But let's face it Bloomberg isn't really selling you a terminal, or a TV station or even a glossy magazine. They are a cloud computing company, selling you the best software as a service product out there for a stock market pro. 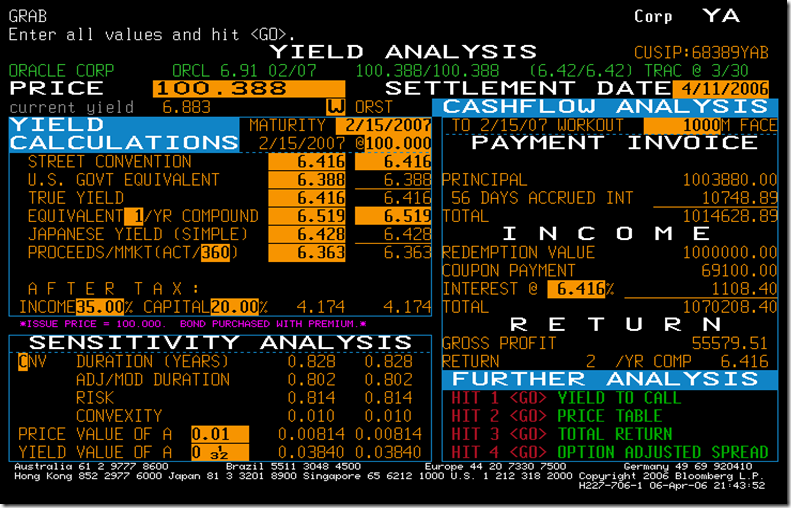 At its most basic level a Bloomberg terminal offers you market information - share price quotes, market news. It also has a proprietary messaging system which allows you to IM any other Bloomberg user on their terminal, app or mobile. That is how it is probably used by 95% of users (all of whom, please note, are paying roughly $20k a year for the privilege. That's called money-for-old-rope). However it goes much deeper than that. In addition to the basic stuff Bloomberg offers 30,000 additional functions covering a wide range of market analytics, industry research (Bloomberg Industries) and a trading platform (Bloomberg Tradebook). In addition it offers an API (BLPAPI) which allows users to download, manipulate and upload data to and from the Bloomberg platform. 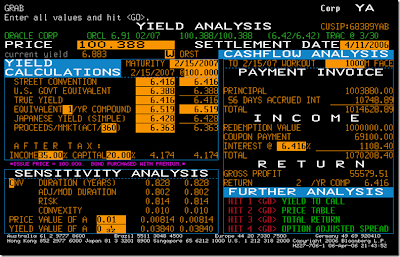 Effectively if you can't find a Bloomberg function that suits you then build your own. Note this is effectively a stealth Platform-as-a-Service offering. Effectively it offers the same service platform as a decent sized investment bank, albeit without the capital commitment, client dining and the free Wimbledon tickets. If you want a poster-child for what cloud computing can do once you centralise the resources and deliver it down a dumb terminal, then this is it. Plus it makes that nice Mr Bloomberg (who owns 88% of the company and runs New York in his spare time), enormous sackloads of cash. Bloomberg is notoriously secretive about their financials. As a Delaware-registered limited partnership they have minimal public disclosure requirements, which you can see on their website - long on funky colours, short on numbers. So how big actually are they? One good place to start is the 2007 Merrill Lynch annual report. Until 2008 Merrill owned 30% of Bloomberg, and in the last report before they sold the stake where was some limited disclosure of financials (see page 116 "Equity Method Investments"). Now the Bloomberg numbers are lumped in with a number of other stakes, but looking at the 2005 and 2006 numbers it looks like Bloomberg was doing in the region of $4-5bn of revenue at that time with a 35-40% operating margin. Note that is on a statutory basis so the underlying profitability is likely to be higher. Of course the credit crisis can't have been good to Bloomberg's core business (selling stuff to banks). However in November 2009 the New York Times said the company was still anticipating revenues of $6.8bn that year. Last year Forbes pegged the business at $7bn of revenues and 13,000 employees. That triangulates with Bloomberg's website, which claims they have 310,000+ professional services subscriptions. If you multiple those up at $20,000 a pop you get to roughly $6.2bn of core terminal revenues. Recent profitability is unclear, but given the nature of the business model I would be very surprised it Bloomberg was doing a sub-30% operating margin. Once you strip out the garnishing of the TV channel and Businessweek magazine, this is effectively a classic subscription software business model. Run a very large data-centre (big fixed cost), plug loads of users into it (who are willing to pay a premium rate which has little relationship to cost of delivery) and you can pretty much write your own operating margin. From my experience of this sort of business, I'd say Bloomberg is doing around a 40% operating margin. This would equate to about $2.8bn of operating profit and $2bn of post-tax earnings. Oh, by the way, that's more money than Facebook made last year. Okay so not growing as fast as Facebook (for the moment at least! ), but give it the 16.5x P/E ratio the S&P 500 is trading on and that gets you to a cool $33bn of enterprise value. Given the high profitability, low capital intensity and barriers to entry for Bloomberg's business (of which more later this week), I would say this business has got a higher earnings quality than the average US company. And if I revert to my old back-of-the-envelope calculation of 10% operating margin = 1x sales turn that would value the business at $28bn. So Incredible post, thanks for sharing Salesforce Integration Services.